Should I cover my floors with tlle or with epoxy? QUESTION: My whole house was covered with tile except for some carpet in the bedrooms. Now I’m redoing the bedrooms because the carpeting was torn up, and I’m wondering whether to put down more tile or just cover the slab with an epoxy coating. Part of the problem is that I have a couple of dogs. A: With those dogs, it might be hard to maintain a concrete floor that was just covered with epoxy. The dogs could really scratch up the surface. It would be better to thoroughly clean off the slab and then put down a thin topcoat of concrete and put on a stain over it. You should visit a showroom that has displays of concrete floors and the specialists there will tell you what your best options are. Q: There are crickets in my house that are driving us crazy. Sometimes I have to pound on the counters in the bathroom to make them stop chirping at night. Is there a good, organic way to get rid of them? A: There are dust-like compounds containing diatomaceous earth that you can inject into the openings around your house and gaps in your walls and cabinets. This material cuts up the insect’s exoskeleton. That’s one way to get rid of crickets without hurting other critters. They often get into your home by crawling under the lip of the stucco at the bottom of your exterior walls. It’s a good idea to get rid of them because crickets attract scorpions that will feed on them. Q: I have millions of rover ants in and around my house in Tucson. I don’t try to kill them; instead I feed them and try to get them to stay in other areas away from my home. I put bread crumbs outside in places where I want them to go. Part of the reason I do this is because I heard that they can eat termites. A: It is true that ants sometimes do eat termites, but feeding the ants so they multiply doesn’t seem like a very effective method of getting rid of termites. Termites are an enormous problem in Arizona. Every colony can hold up to 100,000 of these pests. Most homeowners should have regular inspection of their houses for signs of termite problems that may need special treatment by an exterminator. Q: I have seen the same home inspected by three different home inspectors who then issued three entirely different reports with different things that needed to be fixed in that same house. Isn’t there a more consistent way that home inspection could be done? A: Sad to say, but not all home inspectors are created alike. These inspectors do have to register with the state Department of Real Estate, but the state doesn’t require any proof of their proficiency. Only those who belong to some association of inspectors use a consistent checklist when inspecting a house. 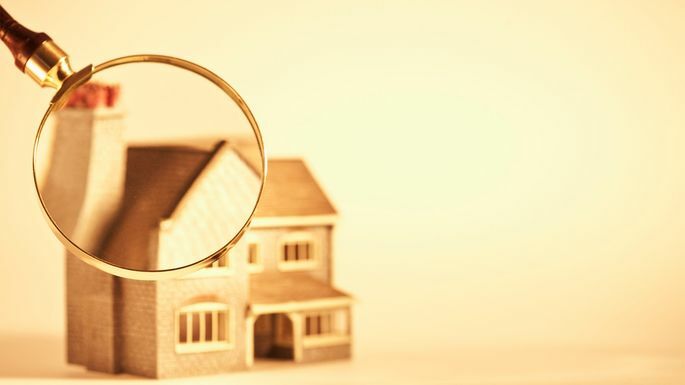 Since the buyers of real estate are the ones who pay for the inspection, they are the ones who should be very careful about whom they pick to inspect the house they want to buy. If you’re a seller and you aren’t happy with an inspection, you should always write a detailed response to the results of the inspection. They say a picture is worth a thousand words. And that's especially true of the all-important step of the home-buying process known as the home inspection. When inspectors scrutinize a house for problems, they do more than take detailed notes of the places they inspect—they snap photos, too. It's a crucial safeguard, since if flaws are caught at this stage, home buyers can request that the sellers make repairs before the deal goes through, or at least throw them some cash to fund these fix-its. Home inspectors can save home buyers a ton of money on issues that otherwise might have slipped under the radar. Photos from home inspectors may not raise many alarm bells to the untrained observer, but in some cases, they sure should. 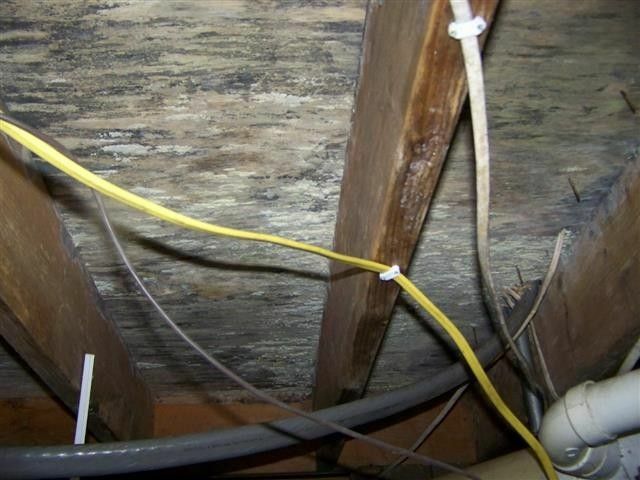 See if you can figure out what's wrong with these home inspection photos below ... and if you're stumped, keep reading to learn more about the problems lurking within. When Scot McLean, a home inspector with Towne & Country Building Inspection in Milwaukee, WI, walked into the basement of this home, he noticed that the top half of the exposed studs were bare wood, but the bottom half had been recently painted. Coupled with the dehumidifier and some fresh cans of waterproof paint that McLean spotted in the basement, he was able to detect a poorly executed cover-up: There had been a recent leak that hadn't been disclosed to the buyer. Gotcha! 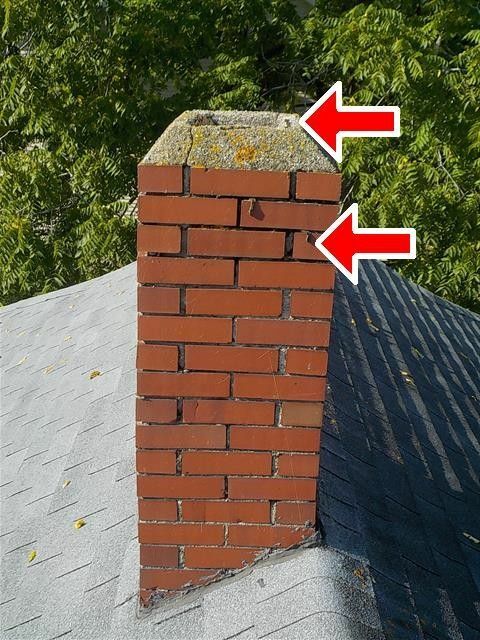 This chimney has not one, but two big issues.Big Moose Home Inspections, Inc.
Tom Ruemenapp, an inspector with Big Moose Home Inspections, Inc. in Bessemer, MI, found not just one, but two problems with this chimney. One, that little crack in the cement could have led to a chimney fire if wasn't repaired. Two, that green moss on top was a symptom of further deterioration. Chimney fixes can cost a homeowner tens of thousands of dollars, so it's particularly important to catch these problems before a deal goes through. And since a chimney's so high up, these flaws are especially hard to spot. After all, climbing on a roof is dangerous, which is why some home inspectors won't even go up there—particularly if it's steep or more than three stories high (here are some other things home inspectors won't check). Some inspectors use drones to get a better look. Just some random ceiling stains? Hardly: That's mold, which can cause a whole host of health problems. Yet mold isn't always apparent to the naked eye. 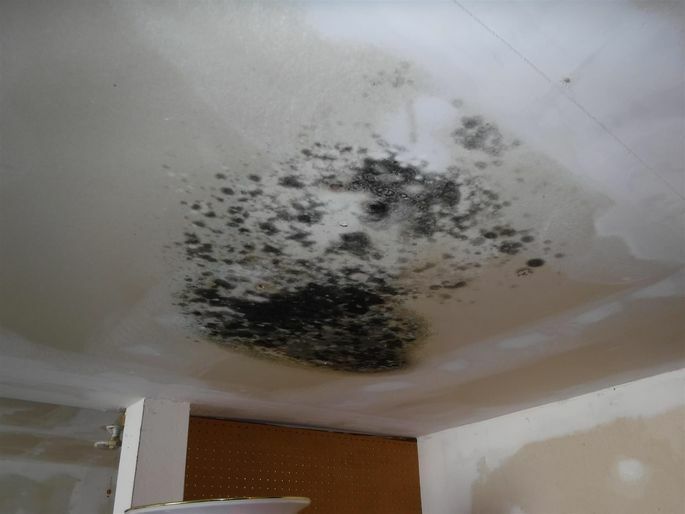 "A simple visual inspection of the mold does not tell a homeowner what they really need to know," Ruemenapp explains. That's why most inspectors use a moisture meter to gauge the level of humidity in a home, which could prompt them to dig deeper. What's lurking under the floorboards?Big Moose Home Inspections, Inc. Check out this image, shot underneath the floorboards of a crawl space. Most home buyers aren't going to squeeze into these tight confines, but it's an area prone to problems. This floor, in particular, was loaded with mold due to a lack of ventilation. Catching this before the sale went through saved the buyer from a ton of headaches and hassles. You know how you have to clean a dryer's lint trap? Well, it doesn't trap everything; in fact, it only removes 25% of the debris that flows through the system. The rest heads through the vent that carries that air outside ... and not all of that escapes to freedom, either. Home inspectors with Mr. Appliance in Waco, TX, shared this pic of dryer events above to point out that it's more than just unsightly; it's also a fire hazard waiting to happen. 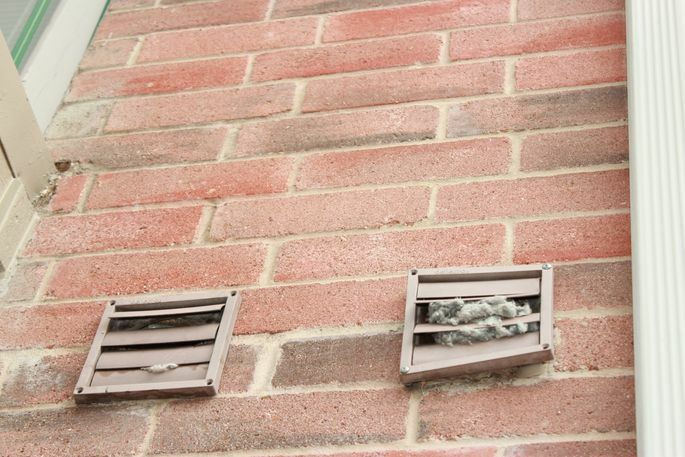 Luckily, this is a fairly easy fix: Just clean out your dryer vents already! It's easy to do yourself, no home inspector required ... although we shudder to think what might have happened if these friendly home inspectors hadn't pointed this out. Jeanne Sager has strung words together for the New York Times, Vice, and more. She writes and photographs people from her home in upstate New York. 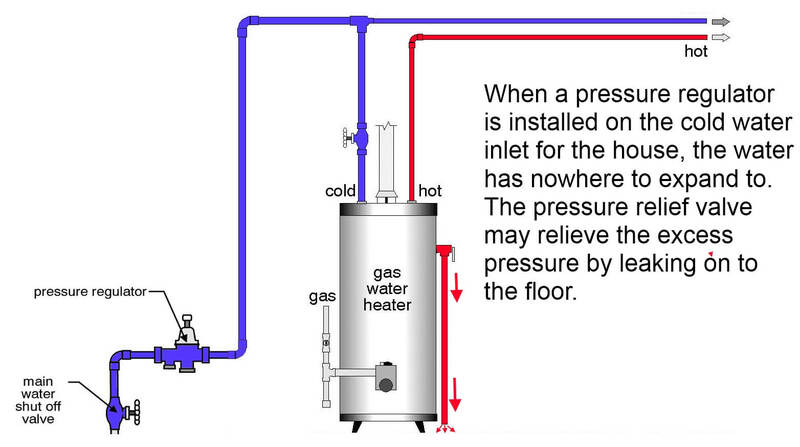 When a water heater is connected to a closed system, an expansion tank must be installed to prevent excessive pressure in the water. To help understand what this is all about, please read on. 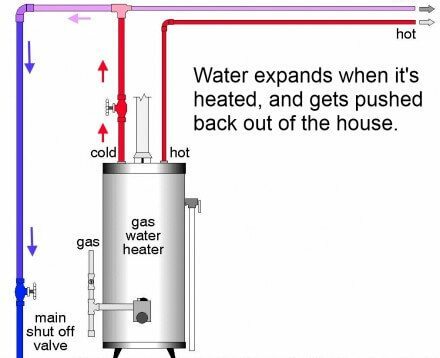 When a water heater fires up, the water in the tank expands. When this happens, where does the water go? Right back out the cold water inlet, all the way back to the water supply coming into the house. The municipal water supply for the house acts as a gigantic expansion tank… and nobody notices. This is illustrated in the diagram below. What happens when a one-way valve, or check valve, gets installed on the water supply piping for the house? The water has nowhere to go. 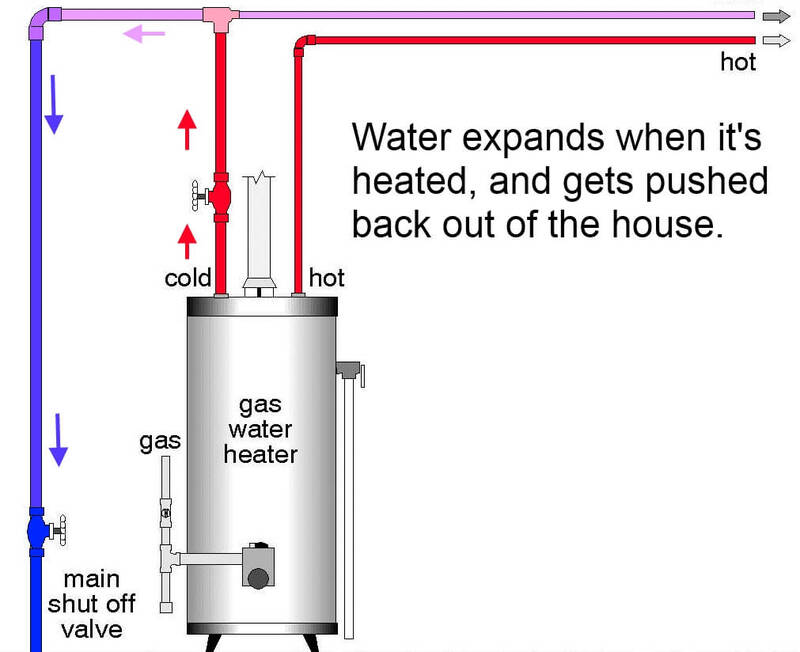 As the water heater heats the water, it expands, which builds up pressure. When the pressure builds up enough, the temperature and pressure relief valve on the water heater simply does its job. It relieves the excess pressure by leaking a little bit of water. This doesn’t happen every time that a pressure reducing valve or check valve is installed, but there may be other problems that show up in the house, such as the toilet fill valves randomly re-filling toilets, or faucets chronically dripping. 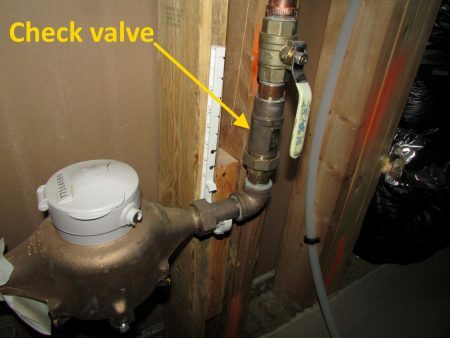 In Minnesota, it’s rare for a check valve to be installed on the water supply line for the house, but it’s fairly common to have a pressure regulator installed. The problem that these regulators can create is that they will act as a check valve; they’ll allow water into the home, but they won’t allow water back out. This creates what is called a ‘closed system’. 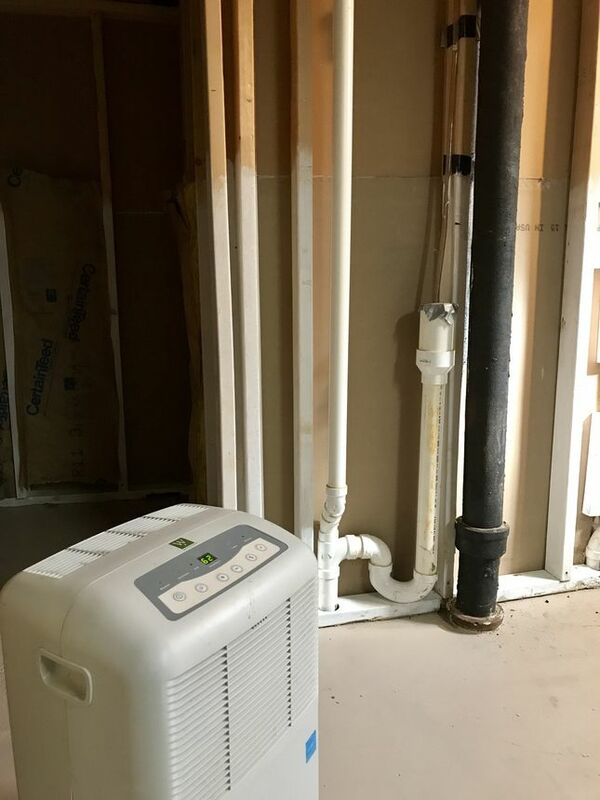 When a closed system exists on the water distribution piping in a home, an expansion tank needs to be installed somewhere on the plumbing system. 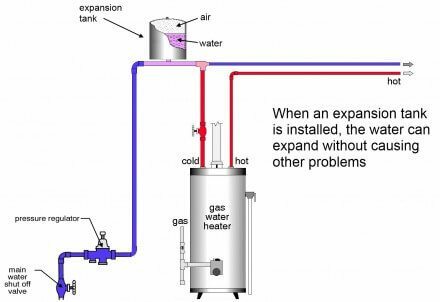 This is a fairly simple and straightforward fix; an expansion tank will give the water somewhere to go when it expands, and the temperature and pressure relief valve on the water heater will stop causing problems. 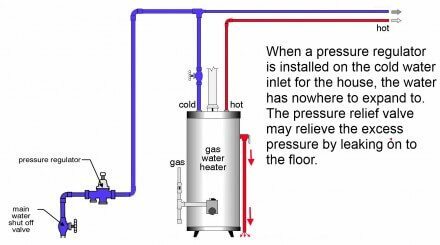 This rule also applies to hot water heating systems; when a boiler heats the water in a hydronic heating system, the expansion tank allows for the water to expand without the pressure relief valve leaking. If the pressure relief valve on a boiler system chronically leaks, even after replacement, it probably means there is a problem with the expansion tank. 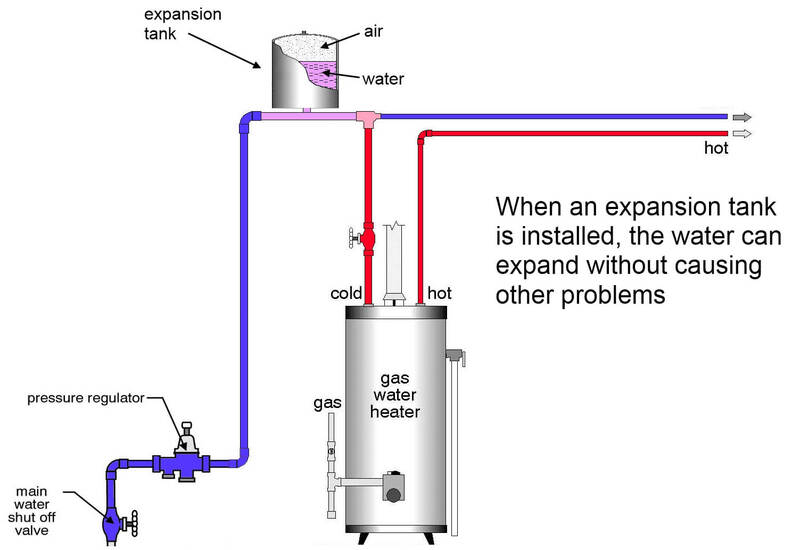 Is an expansion tank required, or simply a good idea? An approved expansion tank shall be installed in the cold water distribution piping downstream of each such regulator to prevent excessive pressure from devleoping due to thermal expansion and to maintain the pressure setting of the regulator. A water system provided with a check valve, backflow preventer, or other normally closed device that prevents dissipation of building pressure back into the water main shall be provided with an approved, listed, and adequately sized expansion tank or other approved device having a similar function to contrl thermal expansion.